Five years after Sonos delivered the original Playbar, still one of the best soundbars you can get for under £1,000, and easily the best in the £700 range, the company is back with a new and mostly improved model. The Sonos Beam. The biggest upgrades are invisible to the eye, but embrace Sonos’s recent partnerships with Amazon and Apple. This new £400 soundbar uses five far-field microphones to double as an Amazon Echo or be controlled via Siri on your iOS device. Only, it will sound better than an Echo or your phone. The move isn’t a surprise. Sonos has been slowly incorporating smarts into its wireless speakers, starting with the Sonos One late last year. What is a surprise is the size of this thing. Sonos claims it is 60 per cent smaller and 28 per cent shorter than the Sonos Playbar, so it can fit under just about any TV available that’s larger than 30 inches. Despite the size, it still packs in four woofers and one tweeter. That speaker setup suggests it would be bass heavy, but Sonos insists software will help make the soundbar nearly as robust as its larger, more expensive siblings, the Sonos Playbar and Sonos Playbase. Another surprising move for the Sonos Beam is that it has just one input type on the back for wired connections from your TV: HDMI ARC. HDMI ARC means you can turn on the TV with the soundbar—useful if you’re using Alexa with the Beam. But it also means that you’re limited on your inputs and outputs. The soundbar will only work with TVs that support HDMI ARC, and most TVs don’t have a specific HDMI ARC-out port, so you’ll be taking up a single previous HDMI port on your TV for your soundbar, which means fewer ports for your consoles and set-top boxes. But at £400, that might not matter for some folks. 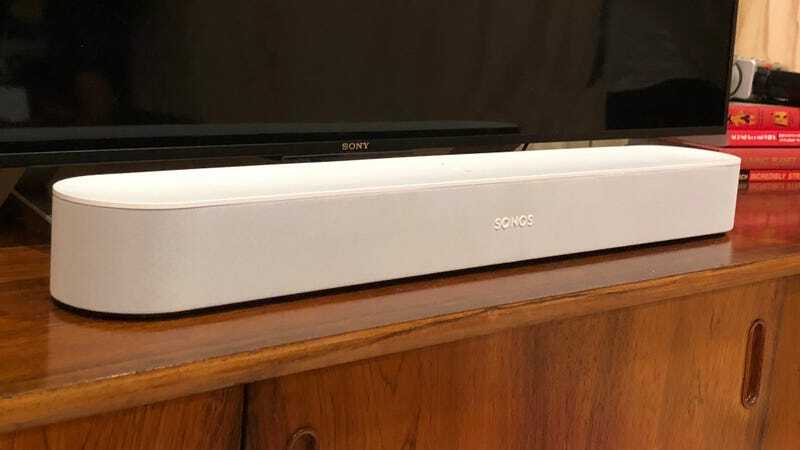 This appears to be the Sonos soundbar for people who are ready to step up from the cheapest £100 soundbars, but not ready to cross the £500 threshold that the larger and better-sounding Playbase and Playbar reside in. The Beam appears to be as budget a soundbar as Sonos has made yet. With natural limitations, like HDMI ARC instead of digital audio, as drawbacks. If you really want a soundbar that doubles as a smart speaker, you can pre-order one today. The Sonos Beam will ship on 17 July.